Homes without gardens are not very nice and feels like cold spaces. The garden gives colour and life to a house, and if that garden is at the front of the house, even better! Each garden also has a style that characterises it, and depending on many factors it may be large, small, overgrown or simply conceptual. There are Asian-inspired, and especially Japanese gardens in particular which are designed with stones of different sizes and arranged with sand in very definite ways. These gardens are already popular in the West for its beauty and has made it into the canons of Western designs for the gardens of contemporary homes. 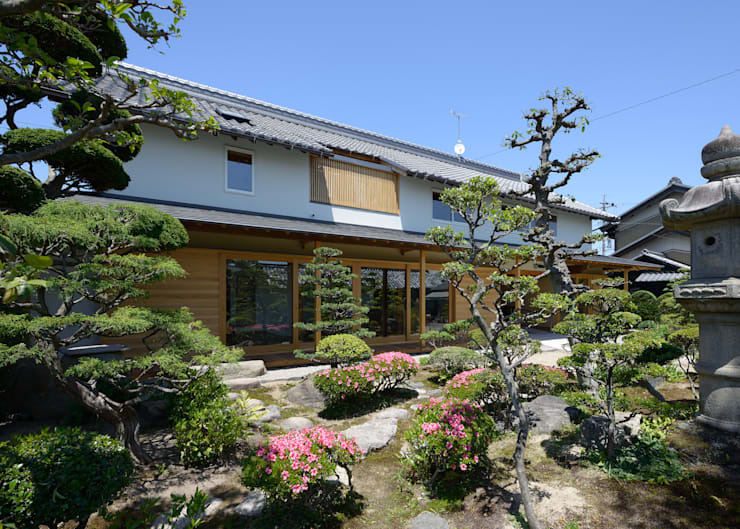 The Japanese rock garden is traditional in temples and public buildings, as well as in private homes. We have also developed a taste for rich Mediterranean-inspired designs, or simple but stylish minimalist landscapes. All these styles are now the subject of admiration and are presented according to the space available and the owner's budget. Here we give you 7 spectacular ideas for gardens to grace the front of your home. In contemporary homes, garden designs are varied—we can find schemes which alternates flowering plants with green vegetation or simply an area where the bushes give a touch of colour. Beyond the plants, the rest is left to the use of different materials suited to the structure of the home, such as wood or stone. 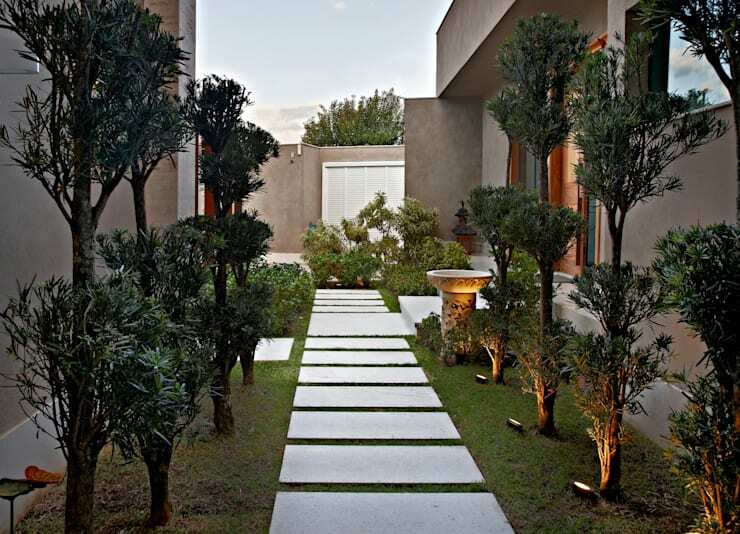 In modern gardens, designers often use such an arrangement as the overall design, and it will set the style of your home in conjunction with the façade of the house. Lights, materials and colours all contribute to this style without changing its inherent aesthetic. If your house follows the minimalist trend that only accommodates design essentials, nothing will be missing, but neither will anything be superfluous.This concept is now welcome in the design of houses and various buildings. We also find this style to be appropriate for a garden of a little house, where ornaments remain out of the picture and a few interesting plants do all the heavy lifting amongst a pebble bed. The concept of less is more is well defined in this garden in front of the house—the green colour and textured materials of the walkway and pebble bed give a very elegant touch to this little, charming house. Who doesn't like flowers? We have yet to find someone who say they hate flowers, and although it is possible that some people consider cultivating flowering plants as more work, most will agree that it is well worth the effort. Flowers can be perennial plants or only last for a relatively short time. Whichever way, they are always a treat for the senses! If you have plants that bloom only at certain times and then die, it is better to plant them in containers or pots where it's easy to replace them with new ones. In this garden we are showing flowering plants as the centre of the design of a charming tiled garden. Potted flowers gives you the joy of colour and smell by means of their pleasant appearance and agreeable fragrance. The Zen garden inspiration comes from those found in Japan and equivalent designs in China. 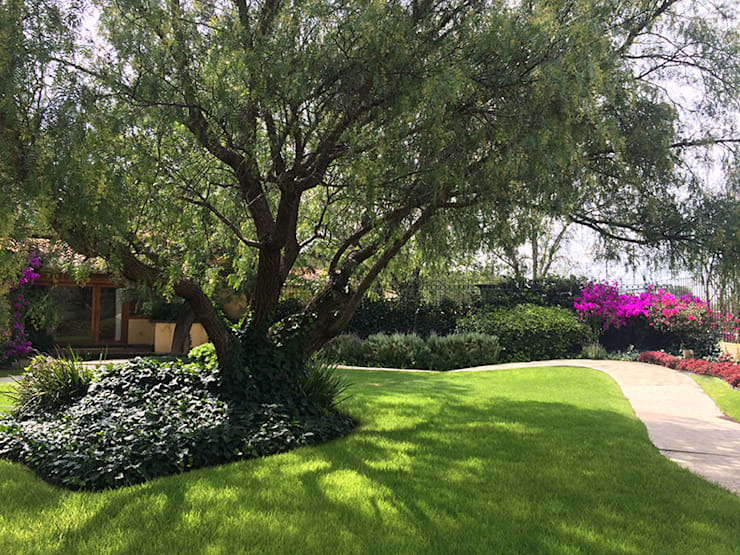 In the West, the Zen-inspired gardens are very refined evoking the rural simplicity of Asian gardens and spirituality. These gardens are based on designs where rocks represent mountains, empty spaces represent the ocean, and everything is complemented by green dots of plants. Lanterns in a Japanese style garden and a sculpture representing Buddha are always popular. 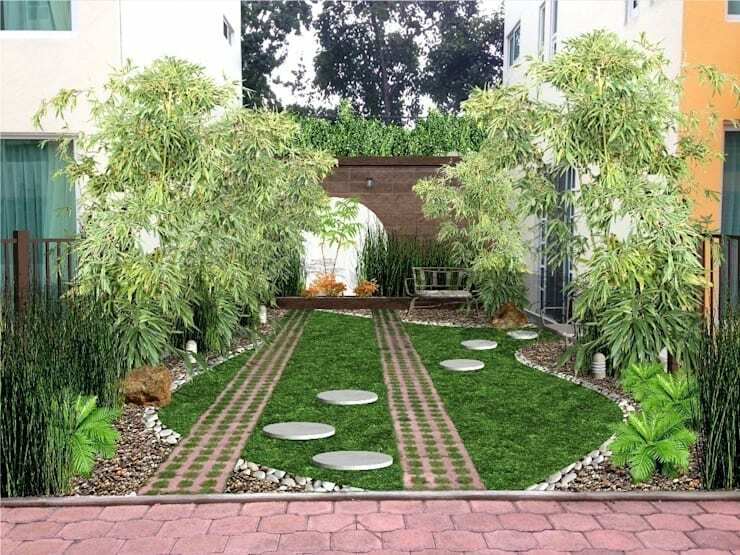 Designs for Zen gardens are continually updated while the basic elements remain the same, and all of it revolve around the use of stones. If your budget is not very generous and you have to stick to it, it is best to design a garden with a reasonable amount of spending. 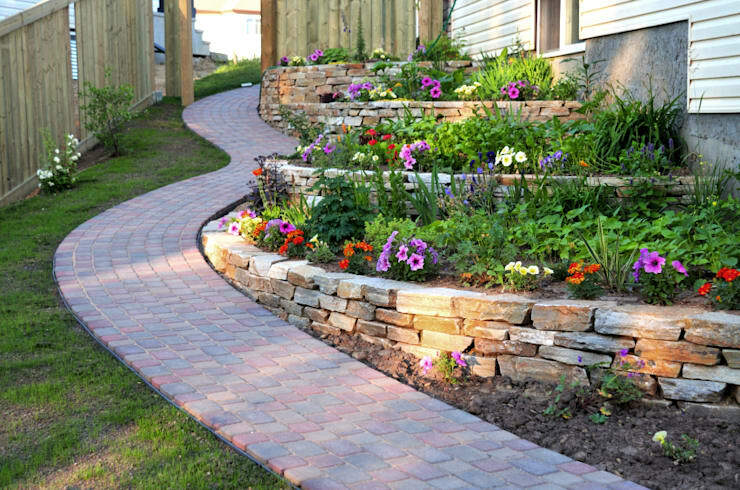 You can place bricks in the form trails, cement pieces that give movement to the design covering the grass and evergreen shrubs placed leaning against the walls for easy maintenance. With a good design you can prepare the budget and decide whether to add more or less detail to suit your pocket. With good planning you can create a beautiful garden that is not too expensive. Everything will depend on the design and beginning by to setting the budget is the key to success. Country-style gardens are common in arid areas, usually where plants like succulents and cacti hold their own. A good rustic garden can be large, but is a style that is not defined by large green areas of grass and rather has elements of stone or cement that outline the spaces where these plants thrive, either directly in beds or in pots. The shrubs are also used in this climate to really coordinate with the rustic style of the front of the house, welcoming all without requiring a lot of maintenance, since the plants need little watering and pruning. 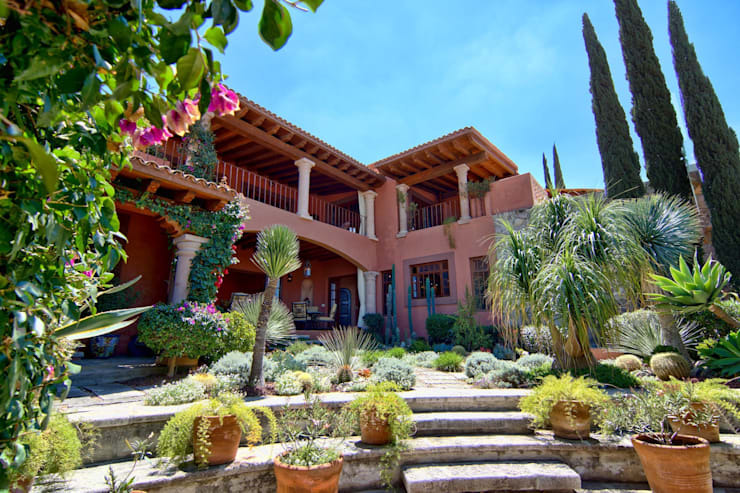 The greenery of a Mediterranean garden is classic and ideal in front of a large house. A garden like the one pictured here with a big tree, grass and hedges of flowering plants will be the main attraction of a plot of land with a large building that is distinguished by spacious terraces and lots of wood. In this garden of great proportions we find shaded areas and the careful positioning of the hedges of different sizes to accentuate the distribution space and access to the home. You can even add some benches or outdoor furniture to the space under trees. Lush Mediterranean gardens are a familiar favourite with big family homes, and judging from this serene image, it is not difficult to see why! For more inspiration, take a look at these: Stunning Garden Ideas For Cutting Edge Homes. Are you planning to make some garden improvements? 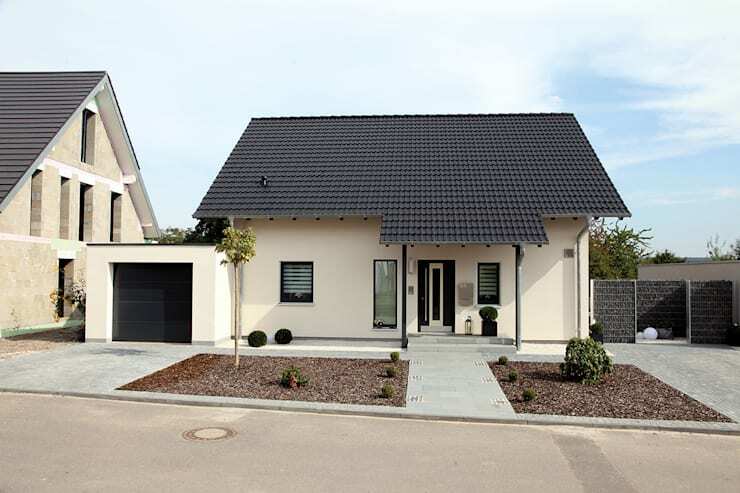 Which of these designs would best suit your home? Let us know!